Kirsty Jones is a Welsh professional kitesurfer, the current British and 2008 Pro Kiteboard Riders’ Association (PKRA) World Championship. Born in Pembrokeshire, the Marloes based Jones made world headlines in 2002 after becoming the first kitesurfer to cross the Irish Sea, in a charity event raising over £5,000 for the Ty Hafan Children’s Hospice near Cardiff. She first became UK Women’s champion in 2001, and won the PKRA World Championship at the final 2008 event in Essaouira, Morocco. Welsh Born Water women Kirsty Jones from the Carmarthenshire countryside was drawn to the sea as soon as she could walk. Kirsty started sailing dinghies with her Dad from the age of three whilst on holiday on the Pembrokeshire coast and then at the age of 16 she discovered windsurfing and surfing and became hooked on the energy of the wind and waves. After school and college she began teaching straight away at the water sports centre in Pembrokeshire to gain experience, then went on to run a watersports center on the west coast of Ireland. During the colder winter months Kirsty would travel to warmer waters around the world in search of wind and waves, hoping to fulfill her dream to become a professional windsurfer. Since then Kirsty has turned her far off dream into reality and competed in the World Windsurfing Championships, surfed for the Welsh team in the Europeans and achieved much success at both sports on a national level. Her passion for windsurfing and surfing led her to try kitesurfing in 2001 whilst out in Hawaii training to do the windsurf world tour. 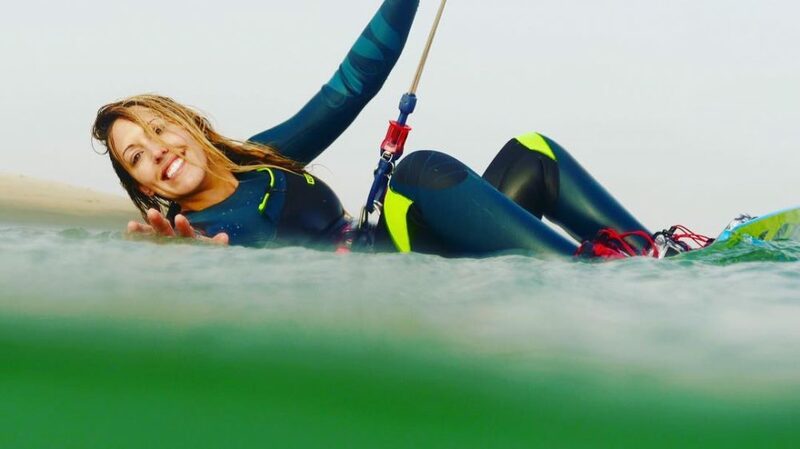 In her first few months of kitesurfing she began competing on the British circuit and at the end of her first year became Ladies British Kitesurfing Champion and set up a successful kitesurfing school in West Wales. In September 2002 Kirsty inspired a new trend in kitesurfing and became the first person ever to Kitesurf from Ireland to Wales, a journey of 85 miles. She did this solo, non-stop, and rose over £5000 for A Children’s hospice called Ty-Hafan.